Pet and Mount Armor and Saddle textures are working again! I improved the render layers to support armor and saddle textures, using models instead of just textures is now going to be very easy to do also as well as adding dyeable collars and other things such as bags, etc for pets or mounts that have a chest added. Last update improved the custom spawners, making them more biome accurate this however completely broke and disabled the non-biome based spawners such as the Fire spawner that spawns Cinders, this has been fixed. Fixed a bug where items weren't playing sounds (Charges, Scepters, Halloween Treats, etc). Default subspecies and mob spawning values have all been changed, older configs will now be reset, if you have a heavily customized config, you can manually update it by changing the version number to 1.14.0.1 in lycanitesmobs-version.cfg. The recipe for crafting Pure Lava has changed to 3 Iron Ingots in a bucket shape, with 1 Magma Cream in the center and a Ghast Tear above. The old recipe left the lava bucket behind allowing players to duplicate buckets at the cost of 1 Ghast Tear, this old recipe will be restored later once I fix the bug. I've lowered the health gain and drops of subspecies, they were dropping far too much and also had a lot of health for 1.9 combat. I've drastically lowered the spawning of Fire, Lava, Ooze, Lunar and Storm spawners as they were spawning too many mobs for 1.9 gameplay, this will also help performance on slower systems or servers. Fixed a bug where subspecies were gaining additional health incorrectly. 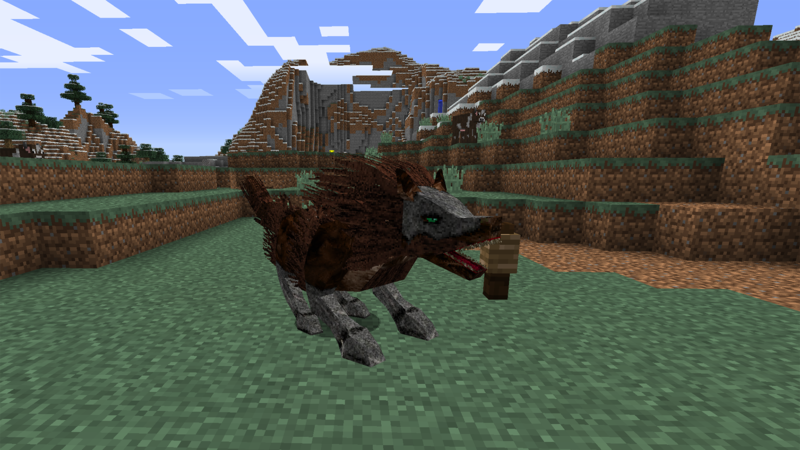 ============================================================ Lycanites Mobs Update: The Return - Version 1.14.0.1 for Minecraft 1.9.0 Configs older than 1.14.0.1 will be reset. ============================================================ -------------------- New Features: -------------------- Pet and Mount Armor and Saddle textures are working again! I improved the render layers to support armor and saddle textures, using models instead of just textures is now going to be very easy to do also as well as adding dyeable collars and other things such as bags, etc for pets or mounts that have a chest added. -------------------- Major Fixes: -------------------- Last update improved the custom spawners, making them more biome accurate this however completely broke and disabled the non-biome based spawners such as the Fire spawner that spawns Cinders, this has been fixed. Fixed a bug where items weren't playing sounds (Charges, Scepters, Halloween Treats, etc). -------------------- Config Changes: -------------------- Default subspecies and mob spawning values have all been changed, older configs will now be reset, if you have a heavily customized config, you can manually update it by changing the version number to 1.14.0.1 in lycanitesmobs-version.cfg. -------------------- Changes: -------------------- The recipe for crafting Pure Lava has changed to 3 Iron Ingots in a bucket shape, with 1 Magma Cream in the center and a Ghast Tear above. The old recipe left the lava bucket behind allowing players to duplicate buckets at the cost of 1 Ghast Tear, this old recipe will be restored later once I fix the bug. -------------------- Balancing: -------------------- I've lowered the health gain and drops of subspecies, they were dropping far too much and also had a lot of health for 1.9 combat. I've drastically lowered the spawning of Fire, Lava, Ooze, Lunar and Storm spawners as they were spawning too many mobs for 1.9 gameplay, this will also help performance on slower systems or servers. -------------------- Minor Fixes: -------------------- Fixed a bug where subspecies were gaining additional health incorrectly.